On Wednesday, January 14, Sami al-Ja’ar, 22-year-old resident of Rahat, was killed by the police during a police raid near his home. The funeral of Al-Ja’ar was held on Sunday, January 18. Toward the end of the funeral ceremony, a police vehicle of the Yoav unit arrived at the cemetery, in spite of an agreement that was made between the Rahat Municipality and the police to ease the tensions and keep the police out. The arrival of the police prompted a backlash and some individuals threw stones at the vehicle. The situation quickly escalated to dozens of police vehicles, accompanied by a helicopter flying over the cemetery with a blaring siren, storming into the area and shooting massive crowd-control measures including tear gas, sponge bullets and shock grenades at the people in the cemetery. Over 40 individuals were injured, with 23 of them needing to be evacuated to the Soroka Hospital, including two policemen. Shortly after arrival at the hospital the death of Sammy Ziadna, 45-year-old resident of Rahat, was announced. Ziadna’s funeral was held in the city of Rahat on Monday, without the presence of the police. The killing of two Rahat residents, citizens of the State of Israel, sparked protests across the country. Residents of Rahat declared a strike, which prompted a general strike across Arab localities. Demonstrations were held on Monday and Tuesday in the Negev, as well as in the rest of the country. The protesters chanted “Arab lives matter” and demanded an investigation into numerous cases of police killings of Arabs in recent years. On Tuesday, the largest protest march was held, starting with a torchlight procession from the house of al-Ja’ar to the mourning tent of Ziadna. 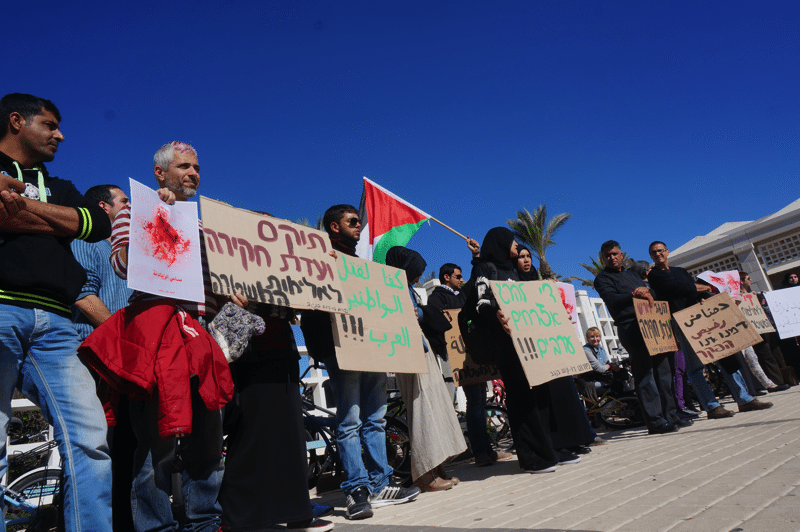 The Negev Coexistence Forum (NCF) members and staff attended the funerals of Sami al-Ja’ar and Sami Ziadna, as well as the demonstrations and protest marches that were held in Be’er Sheva and Rahat in recent days. Following the events, the NCF sent a letter to the Attorney General, Attorney Yehuda Weinstein, calling for an independent commission of inquiry into these two events. In addition, the NCF called on the attorney to immediately dissolve the ‘Yoav’ police unit, which took part in a large number of violent incidents over the past year in the Negev. There is no doubt that the arrival of a police vehicle in the midst of the funeral provoked the violent events in Rahat, and therefore, the events should be investigated outside the Israeli police in order to examine the many failures that occurred in the city in recent days and so those involved in them will be prosecuted. At a press conference held by the district commander in the Rahat police station on Tuesday night, the police chief claimed that the police vehicle, got to the funeral of al-Ja’ar by accident. During the week, approximately ten youth were arrested in Rahat and will be brought today (Thursday) to trial. Three more protesters were detained for questioning during the demonstration at Ben-Gurion University, and later released after a few hours.